In addition to satisfying the requirements of ATEX legislation, most Abtech products also comply with the IEC Ex scheme and are certified for use in Category 2 (Zone 1) and Category 3 (Zone 2) areas for both gas and dust hazards. Abtech also produce restricted breathing enclosures (EEx’nR’) which are capable of housing sparking and hot components. EEx'nR' Enclosures are suitable for use in Zone 2 areas and offer a cost effective alternative to EEx'd' Flameproof Enclosures. Abtech products are of the highest quality with approvals that include BS EN ISO 9001:2000, certification to British, European and International standards and approvals from certifying authorities in the UK, USA, Canada and Russia, the company's commitment to quality ensures that safety is never compromised. Abtech is a leading supplier of quality electrical enclosures and junction boxes suitable for both industrial and hazardous area markets which has been achieved through innovation, market leading design, rigorous testing and adherence to quality control. Abtech also provide products to assist customers with unique solutions to installation and performance problems. 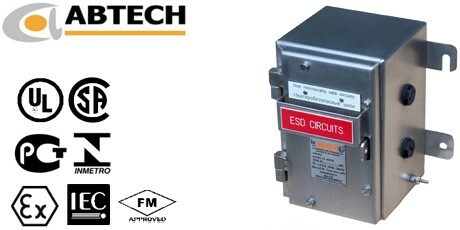 This includes ABTECH high current connection boxes (up to 3000Amps), ABTECH high temperature junction boxes (up to 950°C for 3 hours) and ABTECH IP68 enclosures (up to 120ft depth). The Abtech range of products are suitable for both industrial and hazardous area applications. Enclosures manufactured in stainless steel, mild steel, glass reinforced polyester, aluminum, polycarbonate and ABS are suitable for a wide range of industrial and OEM applications and we have the facilities to modify the standard enclosure to meet the customer’s requirements. These services include machining, painting, silk screen printing and electro-polishing. We are also able to mould any of the plastic range of enclosures in a wide range of colours (subject to minimum order quantity). Abtech technical support encompasses advice on enclosure type, terminal selection, cable entry placement and all other areas that selection. Abtech technical assistance remains available at any time during the order process or indeed after the equipment is installed.